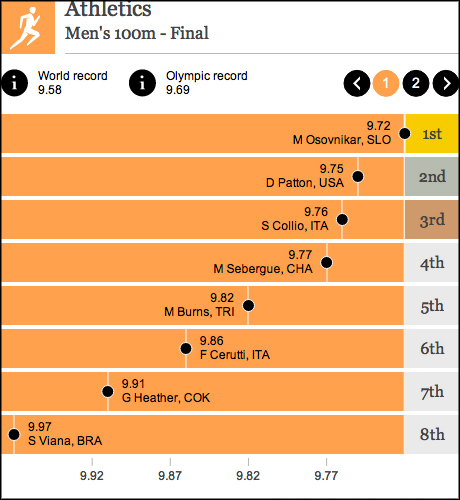 The Telegraph has created a graphics system which will enable its journalists to easily create visualisations for track, field and swimming events as soon as the results are in. The graphics system was created by the Telegraph as part of efforts to get Olympics data in front of readers as quickly as possible, without the journalists needing to do any coding, interactive news editor Conrad Quilty-Harper told Journalism.co.uk. "Livebloggers will be able to go in and pick from thousands of events and actually create a graphic using the data from that as soon as the event finishes," he said. So in the case of the 100 metre race for example, he said once the event has finished "the data hits the PA API" at which point the Telegraph's journalists doing live coverage of the games can "press a button and get a graphic showing the top 8 places" with the relevant timings. "So the idea is you can get thousands of graphics potentially for very little actual human input. And then it produces a very nice looking graphic that can be also shared on separate sites outside the Telegraph," Quilty-Harper added. The resulting graphics will be embeddable and therefore able to be used by journalists from other news outlets. 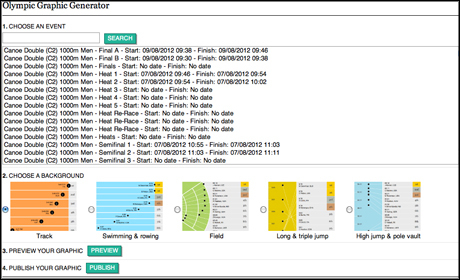 The image below shows the platform the Telegraph's journalists will use to create these graphics, as well as the range of backgrounds available illustrating different event types, such as track, swimming and rowing or field. Quilty-Harper added that the system will also help the interactives team focus on bespoke projects during the Olympics, knowing the main results data is being covered almost as it is happening. "Rather than scrabbling around during the Olympics with the data, we've spent a lot of time researching the API and making it so that journalists can create lots of graphics with very information heavy scores and results and heights and all this kind of stuff, so we're freed up to do a series of bespoke graphics which we'll be releasing throughout the Olympics. Update: This article was updated to clarify that it is the resulting graphics which will be embeddable, and not the graphics system.